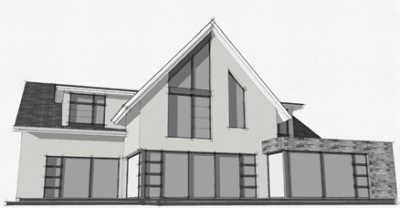 East Dorset District Council: Pure Town Planning are delighted to announce that they have recently secured consent for a unique one off project on Golf Links Road, Ferndown for alterations, extensions and remodelling of the existing dwelling. Plans were designed and drawn by Tony Holt Design. Our client had found the ideal location for their home but the existing dwelling did not match up – they desired something much more contemporary in style. The client came to us with a full set of plans ready for submission where we got to work on our accompanying Design and Access Statement. The statement justified the design of the scheme noting that the existing property currently makes little positive contribution to the surrounding built and natural environment and the proposed plans will make a considerable improvement to both the site itself and the wider area. Along with justifying the scheme in terms of the design, the statement demonstrated there to be no material increase in height nor any harm to neighbouring properties from this proposal in terms of overlooking or overbearing. During the course of the application, the Tree Officer raised concerns that the rear extension would lead to harm on the roots of a nearby tree. We quickly got to work, asking what information is required to remove the outstanding concern and instructed an arboricultural consultant to undertake an Arboricultural Impact and Method Statement. This report addressed the outstanding concern of the Tree Officer and the Case Officer recommend the application for approval without any alterations to the submitted plans – much to the delight of the client.